I live in Sao Paulo and here are some photos I took last night. One thing of note for your readers is that, as usual, the media is focusing on the violence of the protests. The vast, vast majority of the protesters are not violent at all. In fact, a common chant of the protesters is “Sem Violencia,” or without violence. Take a look at the photo that says “Violência é a tarifa” (violence is the fare). Reuters cropped the photo so it only showed the word “Violência,” and then selected largely photos of protesters doing mischief and burning things. Oh well, confirming our ideas about “dangerous Latin America” always sells ad space. Never mind trying to figure out what a place like Brazil is really about. The protests are more than just calling for a 9 cents (US) fare reduction. Brazil has a lot of very serious problems that need to be addressed. But at times during the protests I have been to, I don’t know … while I’m delighted to see everyone out on the streets (especially on Mondaynight), I couldn’t shake the feeling of worry. Where’s the plan? You can’t just hold up a sign that says “End corruption.” Who wants corruption? Who doesn’t want better schools? The call for reducing the transport fares is a good start, I suppose, but 9 cents does not really fix the problem. What about the fact that the system needs to be expanded further? I guess I am worried that the government will cave on this fare hike and then say, nope, sorry no money to improve schools. No money to improve health care. Of course, this response is ridiculous, as they have plenty of money. It’s just being directed into the politicians’ pockets. I may be biased, but this reader is uninformed. They’re right that Dilma herself is not the issue here. Where they’re wrong is that this is just people feeling the economic squeeze. Things have not gotten that bad here economically, at least not yet. And they definitely haven’t tanked on the level that Argentina has recently. No, the point is corruption. The point is that it doesn’t seem to matter who the president is because nothing ever gets done. There are two long-term problems here that are inspiring most of this. The first is that despite being the world’s sixth largest economy, and having higher tax rates than most of the developed world, the money simply seems to disappear. Brazil has famously received tons of money to build stadiums and infrastructure for the World Cup next year. The Brazilian government proudly announced renovations of Maracanã stadium in Rio de Janeiro – the largest stadium in the world – as well as plans to build state-of-the-art new stadiums for the event. It’s since been announced that most of these projects will be NOT ready in time. And not only will they not even be ready on time, but the metro line extensions, the highway expansions, and all of the other promised infrastructure to relieve up to four hours of commuting some Brazilians suffer through each day – none of it is getting done any time soon. Some Brazilian publications have dug into these projects and found – you guessed it – insanely errant spending. Invoices for 500 new gates for a stadium that only needs ten. Paying tens of thousands of Reais for bathroom mirrors that should only cost a few hundred. Somewhere along the way, a lot of money is ending up in someone’s pocket. The second ongoing issue here is the cash-for-votes corruption that went on under the previous administration, or as it’s called here, mensalão. Back in December, 25 high-ranking politicians and government officials were found guilty by the supreme court of money-laundering, fraud, and using government funds inappropriately. Well, of course, these 25 officials aren’t actually serving any time. In fact, the government is pushing through PEC 37, a notorious bill that basically removes all investigative powers of the district attorneys and puts it in the hands of the Federal Policia, who are famously corrupt here. This is akin to Nixon getting caught for Watergate and instead of resigning, pushing through a constitutional amendment to remove the impeaching powers of Congress. As for Bolsa Familia, yes, it has raised many people out of poverty here. But it’s by no means universally celebrated. In fact, in my time here it’s the most contentious and divisive political issue I’ve heard Brazilians speak of. As a gringo, I don’t pretend to come down on one side or the other. Some say it saved millions of lives. Other say that it’s free money to poor people for not working and is pulling the economy down. From what I can tell, it’s probably done a lot of good but it’s not sustainable and is causing as many economic problems as it solves. Look, I’m no economist, but tell me if this makes any sense. You have a country with a massive poor and unemployed population. You also have a country with a terrible lack of infrastructure. What is the OBVIOUS SOLUTION HERE? Pay the poor people to build the infrastructure. Ta-da! You now have a thriving and functioning economy. Yet, the government gives money to the poor people whether they work or not, they tax the middle class to high heaven and pocket tons of the money while providing no new infrastructure. You would be pissed too. And finally, for the record, let’s not all trip over each other talking about how important football/the World Cup is for Brazilian pride. Brazilians have known this was going to be a disaster since Day One. I arrived here a year and a half ago, have been all over the country, and everywhere I go, every Brazilian has told me this was a disaster waiting to happen. I’ve honestly met more Brazilians who are considering leaving the country for the World Cup than ones who are going to try to go. They knew this was coming. All of them. From my girlfriend’s CEO all the way down to the janitor at my gym, they all knew this was going to happen, just perhaps not this soon or not on such a scale. 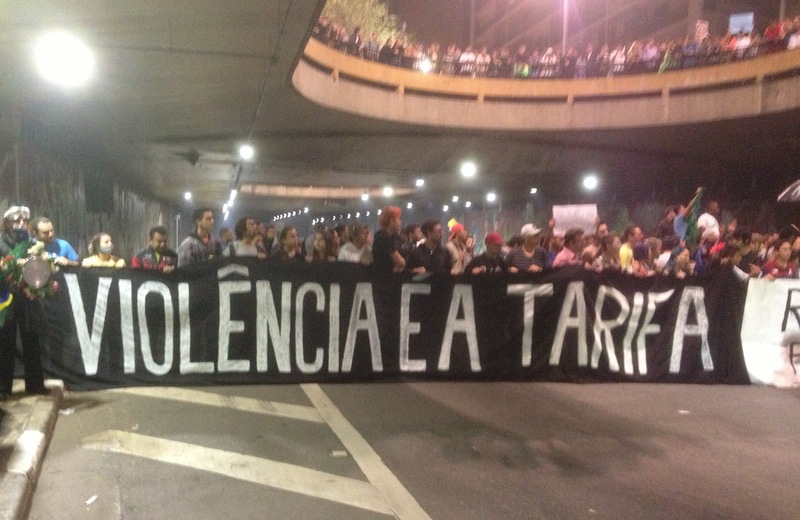 There were more protests in Rio and São Paulo [on Tuesday] night. Monday’s was very peaceful here in São Paulo, but last night the police came out and started exploding tear gas to disperse everyone. There’s another big protest scheduled for Saturday that looks to draw 100k+ here in SP again. I imagine there will be a lot more between now and then as well.